New development as Manchester United midfielder Juan Mata has dismissed reports of an initial strained relationship between himself and Jose Mourinho during the early parts of the campaign. The 28 year old midfielder arrived at the Old Trafford from Chelsea after falling out of favour with Mourinho, who openly criticised the player’s attitude. 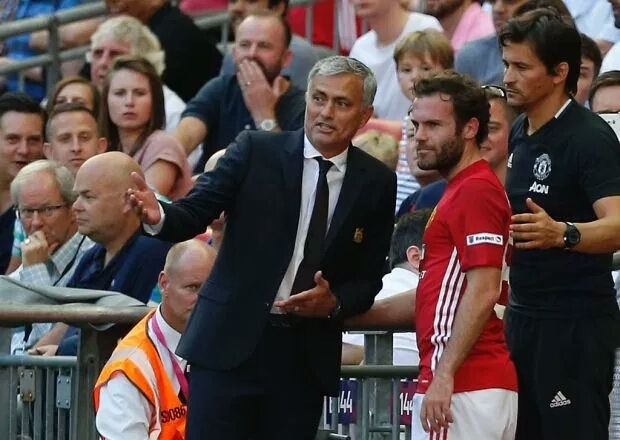 Upon the Portuguese’s arrival at United, there were speculations that the relationship between the pair did not improve, with reports that Mata will leave United due to the presence of Mourinho at the club. Spanish star midfielder has dismissed such reports, revealing Mourinho’s first conversation was about Manchester’s weather, he said: ‘It was a joke about how different the weather is here from London, or something like that! ‘I cannot control what people will think, but I can control myself, and my head is focused on trying to win trophies here and still having a contract here. There are no problems with the manager. So I think people will think less about these things this summer. 0 Comment to "Juan Mata Reveals What Jose Mourinho Told Him After Man United Move"